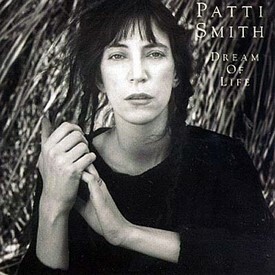 “Life isn’t some vertical or horizontal line; it isn’t neat,” declares Patti Smith early on during Dream of Life. This is true for both the subject and the style of Steven Sebring’s documentary. Most biographical documentaries follow a linear pattern. But when a filmmaker spends 11 years (or a quarter of his life, as Sebring puts it in the booklet of the DVD), it is not possible to fit that immensity of footage into a traditional biopic format. Sebring’s Patti Smith: Dream of Life is epic, poetic and artistic, but definitely not neat. The film opens like a punk rock song – in less than three minutes Smith summarizes her entire life. We learn that she was born in Chicago, got a job at a factory at age 16, moved to New York and met Robert Mapplethorpe, lived in Chelsea Hotel, married Fred Smith, had two kids. In 1989 Mapplethorpe died followed by Fred and her brother Todd’s deaths in 1994. Just exactly how a regular working-class teenager from New Jersey moves to New York and meets someone like Mapplethorpe and lives in Chelsea Hotel isn’t explained – perhaps it isn’t important, perhaps it doesn’t matter. Smith’s narrative of her life during Sebring’s documentary is definitely selective. About her move to New York, all she says is that she knew there was not a chance “to be destroyed or to be created in New Jersey,” and that’s why she moved. Her descriptions of early experiences in New York are Whitmanesque. She speaks of the smells and sounds and the sky, a classic case of a young artist taking in it all in, hoping that someday, she, too, will be a part of the scenery that other young hungry minds will want to absorb. Sebring, on the whole, stays extremely loyal to Smith throughout Dream of Life. This is a biographical documentary about Smith as told by Smith. There are no interviews with friends and family when she is not present. There is no narrator but Smith. Sebring’s film is not a piece of investigative journalism; it is an essay, a poem, a painting Smith created about herself that Sebring captured. Smith doesn’t talk much about her husband Fred, or the details of her relationship to others or her musical career. do you have the quote from Jackson when he talks about birthdays? ?